Well it’s that time of year again, the time of year where zombies, aliens, and talking monsters come out to play on the big screen. Well these talking monsters aren’t the scary kind, but the loveable kind. Like most Pixar films, Monsters Inc. made most of us fall in love with characters that on paper we may not like. So with Monsters University coming out it leaves some of us questioning which characters were more memorable than others. 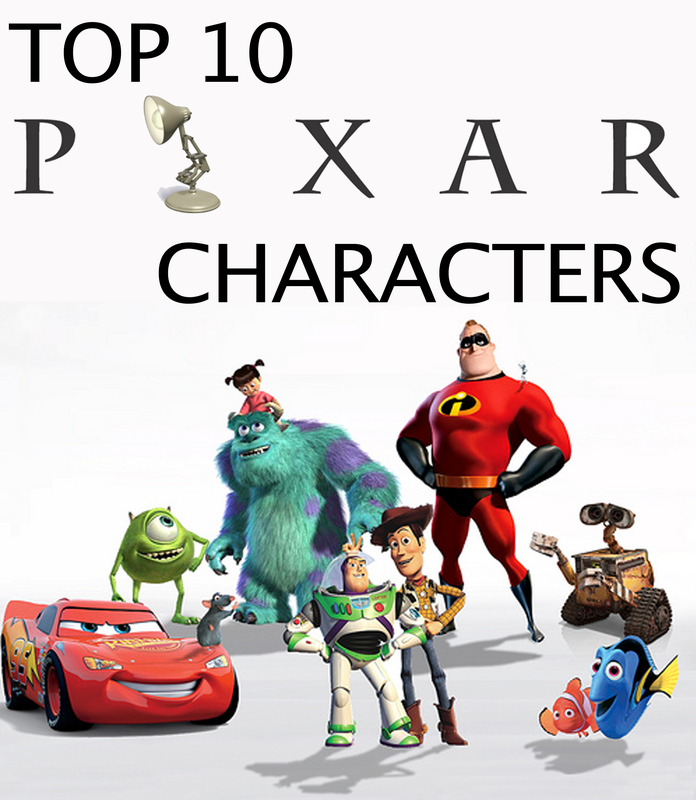 Well here’s a rundown for some of you answer seeking Pixar fans on The Top Ten Pixar Characters. 10. Ratatouille – Remy the Rat: This adorably talented young little cook may not be the most conventional chef but with kids and adults he sores as a fan favorite. With Patton Oswalt’s famous funny voice behind the rat-tastic chef, the character takes on a little life of his own. His small comments on the French cuisine set the film and make him a big star above all the others. With an Oscar win for the film under its belt, It’s safe to say that America loves this little rat. 9. Up – Carl Fredricksen: He may not be the happiest Pixar character, but he is one of the most memorable. As the old man whose dream was to travel the world in his flying house, he made most cry and laugh with his subtle humor and romantic heart. He takes on, reluctantly, the adorable Boy Scout Russell as his partner in crime. 8. The Incredibles – Buddy: The small super villain made his mark as a Pixar character. As a fan turned bad by his hero’s lack of enthusiasm, it shows that he is not one to be messed with. His super smarts and his super gadgets make him a powerful enemy against the Incredible crew, but with his past known is he really a villain or just a disappointed fan? Well one thing is for sure, he didn’t disappointment this fan. 7. Up – Dug: This loyal and funny Golden Retriever may have been the true star of the loveable Pixar film. His innocent and big heart made all who saw him fall in love, and even though he isn’t the smartest in the bunch, he is a true super dog. So when thinking of Dug just remember… Squirrel! 6. Finding Nemo – Marlin: The curious little clown fish had us rooting for him the whole time. His nervous humor and strong devotion as a father trying to find his son made us all fall for him. Although he could never get that mollusk joke just right..
5. Monsters Inc. – Mike Wazowski: The small green monster is anything but small in this film. He is the star of the film and being voiced by the very funny Billy Crystal doesn’t hurt this character either. His antics throughout the movie make the film and without the green guy, the movie just wouldn’t be what it is today. 4. Finding Nemo – Dory: The forgetful fish may have a hard time remembering her part in the film, but the audience will always know her part and who she was. Voiced by Ellen DeGeneres, the upcoming sequel, Finding Dory, was a no brainer from the start. The blue fish was the most quotable character, as well as the funniest, from the film. Besides being a fan favorite, without Dory there was no finding Nemo, literally and figuratively. 3. Toy Story – Buzz Lightyear: To infinity and beyond, or at least to the closest movie theatre. The famous astronaut from the loveable Pixar film makes us all smile with memories. Just about everyone knows who this guy is. He may have been cocky in the beginning and even making the sheriff in town a bit jealous, but in the end there was no Toy Story without a little Buzz to it. 2. Toy Story – Woody: The leader of the group makes his mark as one of the most memorable characters from the Pixar film. Toy Story itself is one of the best animated films out there and is enjoyable to kids and adults of all ages. The film is made by its star Woody and his partner in crime Buzz. Never giving up on his friends and his owner Andy, Woody shows that no matter what happens he will always be there. 1. WALL-E – WALL-E: To me this movie may be the best animated film, and with an Oscar win and critical acclaim, it appears that most agree. The title character WALL-E is a strong symbolic character of the innocence in the world, the good that can come out of the bad, but with little to no dialogue in the film what makes him number one on my list? It is his dedication to those he cares for and his great deal of humanity he shows in a world where it seems to lack any. The film exposes the danger of our easy living and with WALL-E innocently exposing it all, it makes this Pixar creation one to be remembered for ages.